Situated just off I-89, on 14 acres atop a plateau, in the heart of the Green Mountains. Our property offers 83 comfortable guestrooms that are 100% non-smoking. Our first class amenities include a glass enclosed heated pool, whirlpool, fitness center, fireside library and Vermont Covered Bridge. 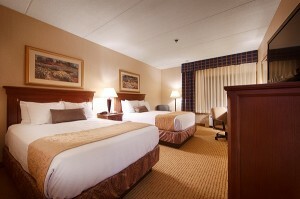 Each room offers bath, HD flat screen TV, Wi-Fi, coffee maker, refrigerator, hair dryer and iron. Many rooms feature mountain views. Some handicap accessible rooms available. All rooms access via interior corridors. Elevator, luggage service and coach parking are available. Our group packages include overnight accommodations, welcome reception with homemade cookies, coffee and warm apple cider, luggage handling, and a hot buffet breakfast each morning. Group dining is available with prior arrangements. Our central location is an ideal headquarters for your daily tours. 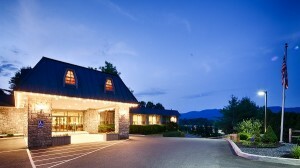 The Inn is conveniently located between Burlington, the State Capital of Montpelier and Stowe. Surrounding attractions include: Ben & Jerry’s Ice Cream Factory (.5mi), Cold Hollow Cider Mill (3mi. ), Cabot Creamery Annex (2 mi. ), Keurig Green Mountain Coffee Roasters (1 mi), Rock of Ages (23 mi), Stowe Village (10 mi), Church Street Marketplace (27 mi), Ethan Allen Cruise line (26 mi), and the Vermont Teddy Bear Factory (32 mi) . It will be our pleasure to work with you to develop a unique itinerary for your Vermont tour.